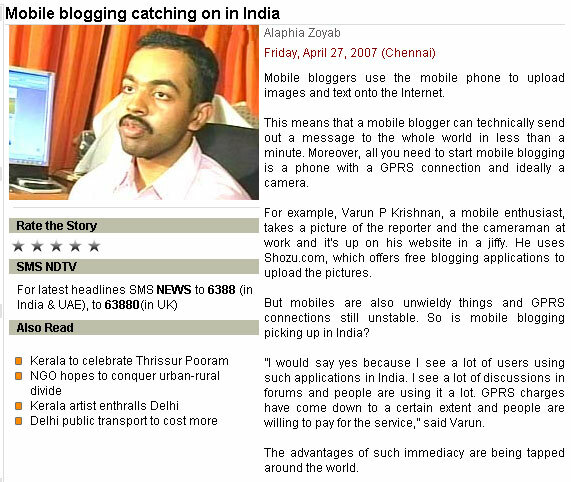 NDTV wanted to do a feature on Mobile Blogging.So they contacted me through Kiruba. The reporter and the crew came to my place on Wednesday evening after I was back from work. I spoke about Mobile Blogging , MoMo Chennai and other related stuff. Hope the video will be up soon as well. I love the E60 form factor. But the sad part is that the phone is not available atleast in Chennai. But Nokia E65 and E61i look interesting. E65 is a fat slider with a Cam. E61i has a Cam but is slimmer. All Mobile Freaks are headed towards Chennai on May 6th. Reason ? MoMo Chennai is going to take place on that day. Our intention is to bring the event to Chennai as a lot of Mobile activity is happening here. We plan to conduct this event in a quarterly basis and probably if things go fine turn it into a monthly event. With 3G round the corner and number of Internet enabled mobile phones in the country growing fast. Web Applications on Mobile Phones are the talk of the town today. We would have Professionals and Technologists from the Mobile Industry sharing their knowledge with the audience. The wait is finally over. The folks at TKF and I have set the date for the launch of MoMo (Mobile Monday) in Chennai. The event will be of 3-4 hours duration on April 22nd – Sunday. It will comprise of talks on tech and non tech topics and a whole bunch of mobile product demos. You can find more info at the following places. You can mail me varun at [nospam] fonearena.com if you would like to be a part of the event. Mobile Monday is coming to Chennai soon. BangaloreÂ , Mumbai & Delhi. ThanksÂ Â to Kiruba andÂ theÂ folksÂ atÂ TKFÂ forÂ encourgingÂ meÂ toÂ takeÂ theÂ initiativeÂ forÂ theÂ show.